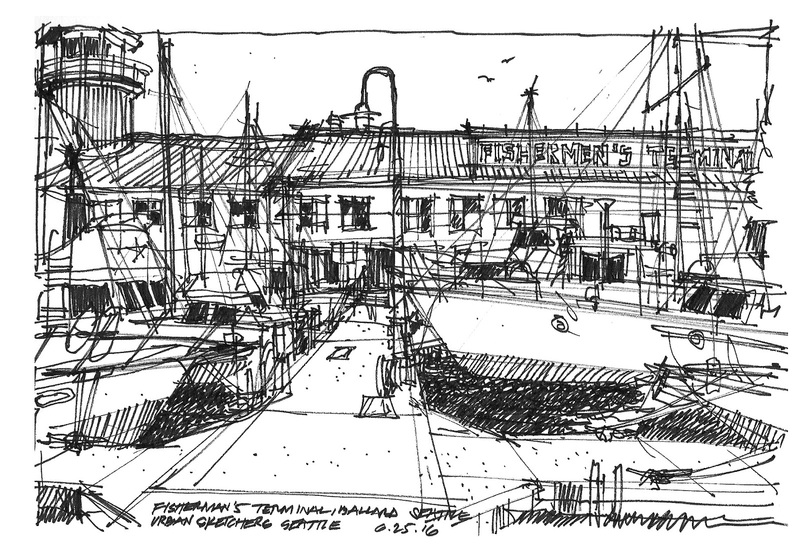 It was a perfect day for an outing; sunshine, cool breeze, and about 30+ of fellow sketchers met up at Fisherman's Terminal in Ballard to commemorate 7-year anniversary of Seattle Urban Sketchers. I wandered around and decided to spend sometime on Dock 8. There's so much detail and interesting angles. I sketched an overall perspective looking south with boats moored on both sides of the docks. The textures of rust on the metal, the countless masts, the intricate fishing equipment, they were feast for the eyes. I sat on the edge of the dock and sketched one of the fishing boats, attempting to capture as much detail as possible. 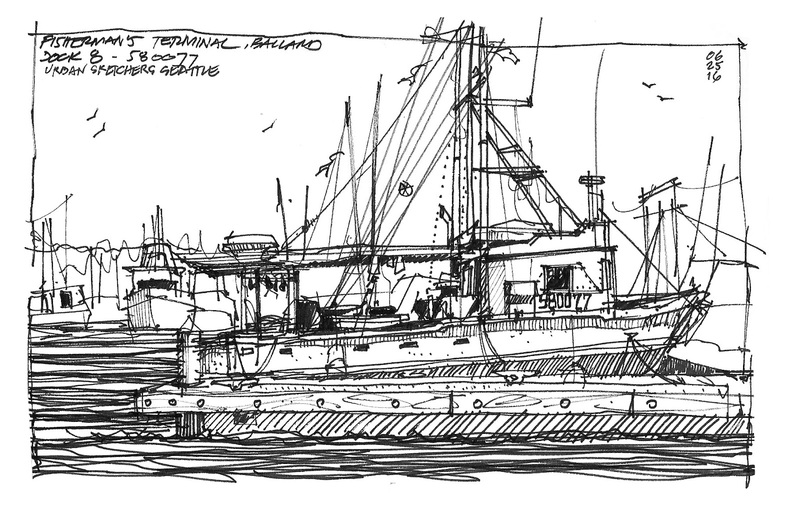 Towards the end of the session, I decided to sketch a salmon vessel moored right across the main terminal building. 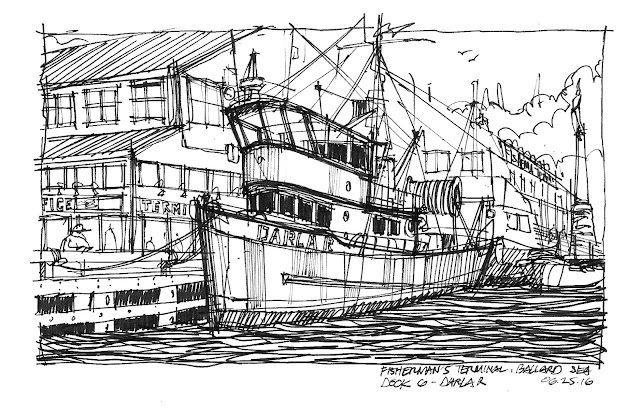 This vessel, Darla R, was a popular object for the day, for lots of other fellow sketchers decided to capture the same vessel. At the end of the outing, we shared our sketches in what's called a "throw down" session. It marked the end of one of the best outings I've been to and I am already excited for the next one. Happy Anniversary, UsK Seattle! Wonderful sketches! So Darla R is a salmon vessel? I forgot to look her up when I got home. It really was a great day... so many sketchers and so many great sketches! Thanks Kate. That's what a buddy a mine told me of Darla R. Not sure if it's true though :) Yes, awesome day for sure. Fantastic sketches, Andika -- you captured all those textures well! And great photo of the throw-down, too! Hi Tina, thank you! It was great to see everyone after missing out on past outing. Really great sketches! Sorry I missed this event! Thank you much, Gail! Hope to see you at the next one. So many and all so intricate. Impressive! PS the loose lines of the masts and the ropes are awesome. I especially like the squigglies on the left of the middle sketch. Thank you, Jackie! I really appreaciate the compliment.